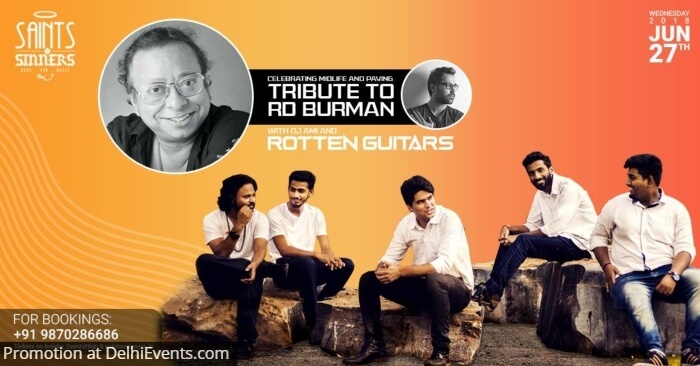 Rotten Guitars is a Sufi Bollywood Rock Band with a focus on giving extensive vigor to devanagari Songs- A new revived push. Their genre is quite broad but they specialize in performing Fusion with Sufi, Bollywood, and Rock. The band is the winner of Pune film festival 2018 and were awarded by AAJ KI DELHI Magazine in 2015 for BEST RISING BAND OF DELHI. Their 1st Original song “Piharwa” was nominated for DADA SAHEB FALKE AWARD in 2017 for best debut music video & has already been covered by more than 15 newspapers & magazines( like Times of India, AIN, Outlook Express) & crossed 54,000 views on Youtube. What's better, it's not just his birthday that we are celebrating but we are also celebrating being in the middle age of life. So if you are 40 years and above, take the maximum age discount on food & 15% off on drinks.